Named after Palm Beach in Florida, the Gold Coast’s Palm Beach is just as gorgeous, and has already been voted Queensland's Cleanest Beach three times running. Located right between Burleigh Heads and Currumbin, our Palm Beach hotels will put you in touch with the best that the Gold Coast has to offer, without the crowds. Surfing, swimming, sunbaking and romantic beach strolls are just some of the best things about Palm Beach. The fresh produce at the Palm Beach Farmers' Market, on every Saturday morning, is also pretty special. However, the ultimate spot in the area is probably Palm Beach Reef. It's a great spot to go scuba diving and you'll see lots of beautiful tropical fish below the surface, as well as stingrays and maybe even a leopard shark in summer! Another great place to visit is Tallebudgera Creek, which is wedged between Palm Beach and the Burleigh Heads National Park. It's a great place to go fishing, swimming, kayaking or just to have a picnic. If you're on holiday with the kids, make sure you head to Laguna Park, which has a fantastic playground. Occasionally you’ll listen to the sweet sounds of live music in the park on weekends. For a holiday in Palm Beach, check out these cheap flights to Coolangatta. 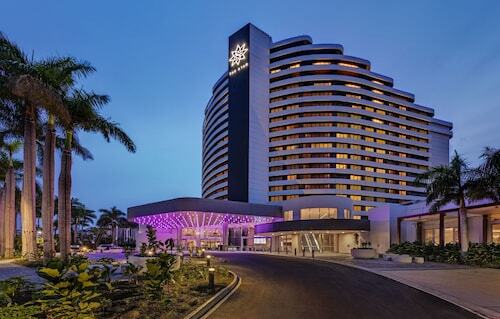 The Gold Coast Airport is only 10 minutes away, but if you arrive in the early hours of the morning, you might want to stay in one of these hotels near Gold Coast airport for a night. There are plenty of buses and trains that service the area, so you shouldn't have any problems getting around. Another great thing about Palm Beach is its location. 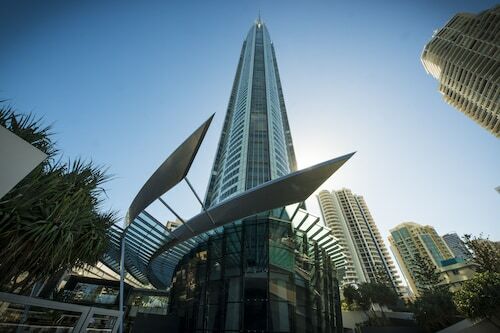 Surfers Paradise is 15 minutes away; Australia Fair Shopping Centre in Southport is only 20km away; and the theme parks (Dreamworld, Sea World, Warner Bros. Movie World and Wet'n'Wild) are about half an hour away. If you're planning on spending a few days at the theme parks, you can stay in one of these hotels near Gold Coast theme parks. So for a holiday in a perfectly located paradise, book your flights and Palm Beach accommodation now, before it's too late! How Much is a Hotel Room in Palm Beach? Hotels in Palm Beach start at AU$72 per night. Prices and availability subject to change. Additional terms may apply.